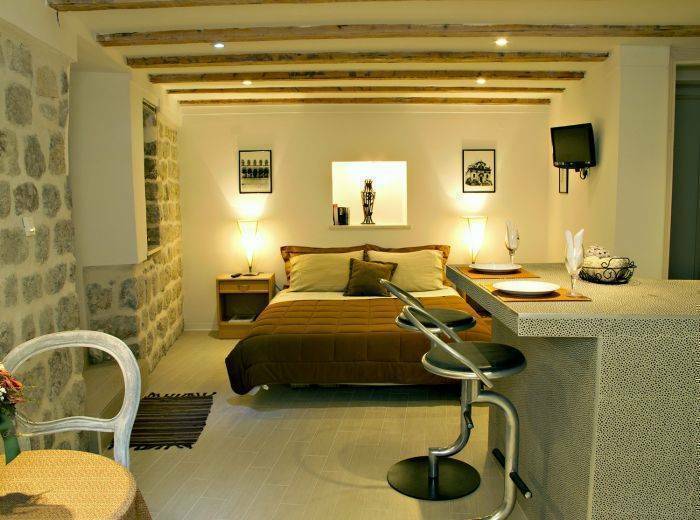 Stylish studio suites in the heart of the historical Old Town of Dubrovnik. Walk to all attractions, beaches, restaurants, shops and much more.... all just footsteps away! 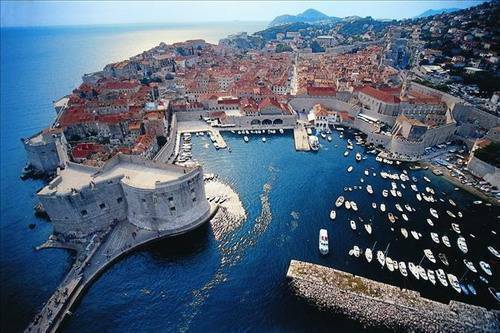 Magical Place ... Wow....Dubrovnik is truley a magical place...it will certainly take your breath away. Our lovely studio suites are located in a quiet cobblestoned side street in the center of the historical old town, just 70 meters off the main strip PLACA (STRADUN). Each of our specially desigend airconditioned units provide our guests with all the comforts of home and consist of a king or queen size bed, air conditioning, LCD TV, living/dining area, fully equipped kitchen and bathroom with shower. A perfect place for a tranquil retreat. The suites are located in a completely redecorated building dating from 1700's and are exquisitely elegant and comfortably sophisticated, and here you will enjoy the perfect combination of contemporary and old design, inspired by lavish colours and textures rooted in the traditional Dubrovnik style evoking a sense of past times. 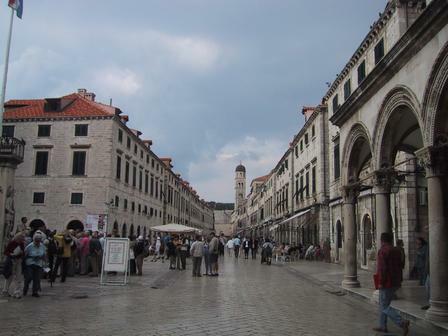 Just 70 meters from the prominade strip PLACA (a. k. a STRADUN) lined with 13th-17th century limestone buildings, with several medival, rennassaunce / gothic churches, restuarants, terraced caffes, shops, museums. At one end of the PLACA is the Pile Gate where you can visit the Onofrio fountain, walk the fortress walls, stroll through the Franciscian monastary with a centuries old preserved pharmacy. At the other end is the famous clock tower, Orlando monument, Sponza Palace museum, Rectors palace, St Blaise churh, the catherdral, the Dominican monestary, old town port which offers a fascinating Mediteraininan ambient to the Porporela, speciallty restauants, and ferry excursions to the islands. Each of our stylish private studio suites comes fully equipped, air-conditioned with a king or queen bed, Flat screen TV, livngrm/dining room, fully equipped kitchen, and bathroom with shower. WE DO NOT SERVE ANY MEALS IN THE SUITES. RESTAURNATS AND CAFFES JUST 50 meters from the studios! 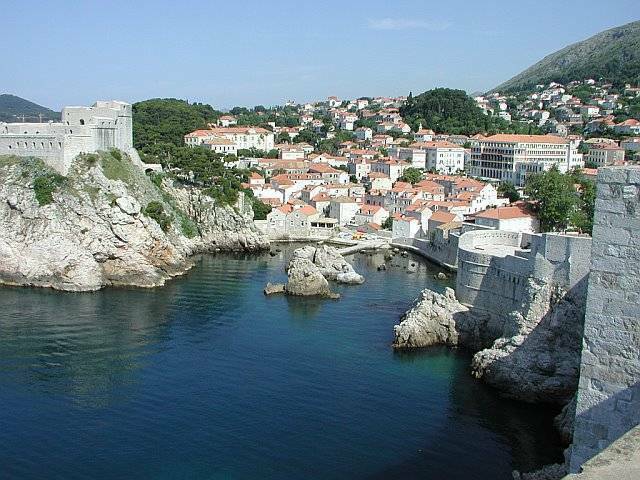 In a quiet residential neighborhood within the fortress walls, yet within a 2-10 minute walk to everything. A croatian specialty restaurant with fresh fish. 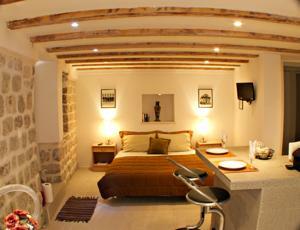 No shows will be charged the full stay amount, Cancellation less than 10 days from arrival date will be charged 1 night. 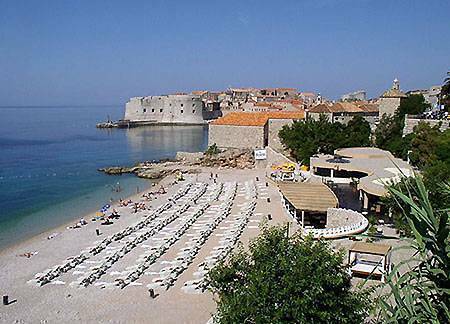 From the airport, main bus or main ferry port take a local bus to the PILE GATE (enterance to the old town. A detailed map with directions will be meiled to you upon reservations confirmation. Airport transfers are available at an additional charge.